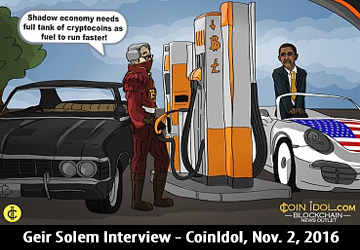 Geir Solem is the founder and Chairman of Cryptor Trust Inc. group of companies and Chief Editor of Bitcoin Investor. Geir is also the founder of Elliott Wave Technician and Cornupia Capital Ltd. He is also President of the Cryptor Foundation. His specialties include analysis of the financial market using demographics, economic cycles, and Elliott Wave theory / technical analysis. Geir focuses on investment in long term trends around the world. He engages in trading of commodities, bonds, stocks, and currencies. 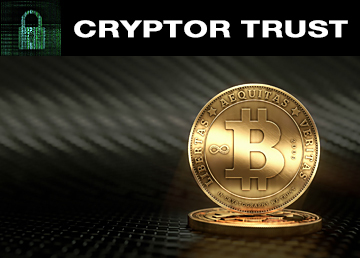 Cryptor Trust is the first and still one of the few investment groups in the world to introduce a formal capital structure based on Bitcoin, holding Bitcoin and blockchain related investments as its main assets as well as expanding into distributed, blockchain based finance. 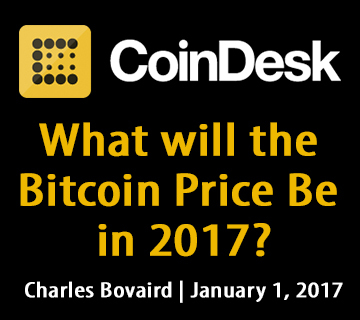 Note: The forecasting was done by Cryptor Trust in December, 2016 when this interview was conducted. GCV: How are cryptocurrencies and blockchain, in particular, affecting fiat economies and the financial industry right now? Will the value of cryptocurrencies skyrocket if the current economic system and the banks fail due to the enormous amount of debt owing and its unsustainable structure? GS: Cryptocurrencies are one of the few safe places for your money. Investing in precious metals is another option but it is more suited for long term storage of wealth and is not as practical to store and spend. The value of the different cryptocurrencies will vary depending on how widely a specific cryptocurrency is issued and its popularity. Bitcoin has a very limited edition restricted to 21 million Bitcoin, it is currently the most popular cryptocurrency, and is thus the most deflationary currency out there. Litecoin is issued on a more generous scale, and is not as popular as Bitcoin, and is not appreciating in value as strongly as Bitcoin. Many of the cryptocurrencies out there are issued on a large inflated scale, the popularity of them varies, and many of them will decline in value over time as they lose their popularity, or possibly go extinct. Bitcoin and other cryptocurrencies can be very price volatile in the short and intermediate timeframe compared to the world’s dominating fiat currencies like the USD and Euro. The long term price of all fiat currencies is zero. The USD has lost about 98% of its value since 1900. This means that you cannot use fiat currencies for long term storage of wealth. GCV: How would you assure and convince people who are still leery of the security issues that plague cryptocurrencies and blockchain technology that they are safe, especially for investors? GS: Security is relative. Bitcoin and other cryptocurrencies are already quite secure to use and store compared to fiat currencies. Remember that with fiat, your bank, authorities, lawsuits, etc. can block your bank account at any time and in the western world, this happens more and more often. They do not necessarily need to go through the court system to do that. Banks can go bankrupt. Border guards can confiscate your fiat cash at the border. Wars happen all the time around the world. Nations go bankrupt almost regularly. Our forecast indicates that more European countries than Greece and Cyprus will fail and introduce currency restrictions. Italy is already heading for default with their entire banking system. Will you be able to easily transfer money out of an Italian bank in a few years’ time? All things considered, cryptocurrencies actually look very safe compared to fiat currencies. GCV: What advice would you give to investors who are planning on investing in cryptocurrencies and blockchain technology now and in the future? GS: If you want to be an investor there is a lot to learn. You could begin by starting to use new technologies, make small investments in different emerging tech companies and read books, articles, and websites about investment. Over time you will gain the knowledge. The biggest problem is finding good investment books and websites as there are many and most of them will not help you. We have a small library of recommended books at blog.elliottwavetechnician.com The books are written by the best in the global investment business and innovators of tools (technical indicators) used for technical analysis of price structures. The price trends of stock markets and commodities are a manifestation of mass psychology. Demographic trends are also very important in developed consumer countries, as well as long term economic cycles. The books and websites in these areas are where you find value. GCV: With respect to investing in cryptocurrencies, how does Cryptor Trust assist investors? GS: Most people do not have the skill, are not able to, or do not have the time to do investment research, follow the markets, and do their own forecasting. An investment company has it as their business to do this and there is quite a lot of work related to it. We do demographic research, technical analysis of most global markets (which is the study of price structures), and follow long term economic cycles, in addition to following the latest trends in technology. As practical examples of why you need investment skill is market timing. You can analyze if a market is very expensive or very low priced historically (100 years perspective) by looking at margin debt, how heavy mutual funds are invested and by using some weighted p/e. Take the NYSE stock exchange which is now very expensive in historical perspective (last 100 years) using those indicators I mentioned. The margin debt on the NYSE is now hovering around the highest ever in its history (investors are so optimistic that they borrow money massively in order to buy/invest in shares), mutual funds are fully invested with less than 3% cash (they are looking at the last 100 years, usually fully invested at market tops as they share the general optimism of the crowd, and at the end of large bear markets, they sit with a lot of cash fearful of investing), and the weighted p/e we use are at extreme historical levels. Tops are built on hopes and can take a long time to play itself out. Tops are a good time to sell your investments. A future large market correction will create investment opportunities of a lifetime. Usually the ‘grey market’, where most of the new emerging players in the Bitcoin, blockchain & FinTech arena are fine themselves, but will collapse in value during major market corrections. When this occurs, there will be an opportunity to look at the players that survive. GCV: How will Bitcoin perform compared to other currencies if the fiat currency fails and explain in more detail what the “grey market” is and how volatile it will be for investors? Bitcoin and other cryptocurrencies have their own life relative to stock markets, commodities, bonds and fiat currencies. 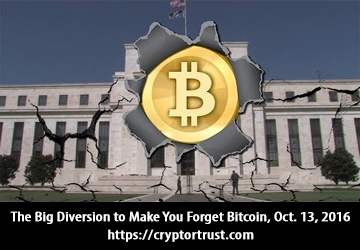 However, it is likely that the demand and their uses will increase the more devaluations and restrictions there are on fiat currencies around the world. 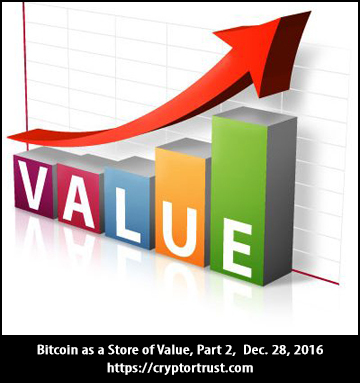 However, the price of Bitcoin is clearly driven by mass psychology as prices are for stock markets and commodity markets. The grey market is traded ‘over the counter’. Often brokers create an informal market for securities that are not listed in the government regulated formal exchanges. The grey market is a very good barometer of the liquidity in the economy. When a recession begins, they are the first to feel the cash squeeze and become illiquid. With all of the debt problems around the world, especially in Europe, Japan and the US, a contagion can begin at any time now, and defaults in one country will spread to other countries. Debt bubbles can burst as shown in US history with two previous periods of deflation in terms of magnitude: 1835 – 1842 and 1929 – 1932. During these periods, the value of financial assets almost disappeared. This is truly frightening. If history is any guide, expect deflation to follow. As a government/state defense, expect currency restrictions to be introduced in countries with debt problems. When comparing countries, the US is in the best position because they have the world’s reserve currency. However, extreme money printing in order to pay down debt usually leads to the loss of having the reserve currency. Long term, this is the likely outcome for the US dollar. The average life expectancy for a fiat currency is around 27 years. Approximately every 30-40 years the monetary system breaks down and needs to be redefined. 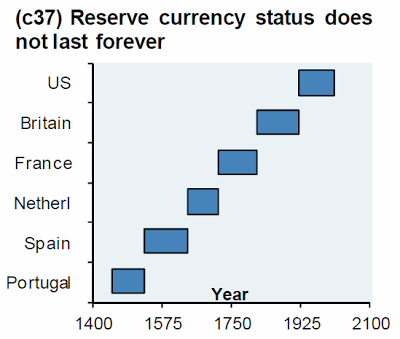 Here is a chart showing the lifespan of fiat currencies historically. The British Pound Sterling also known as the pound (XBP) is so far the most successful reserve currency in the world and is the oldest currency still in use. Prior to WWI, the United Kingdom had one of the world’s strongest economies, holding 40% of the world’s overseas investments. However, after the end of the war, the country was very indebted and lost the reserve currency status to the US dollar. As far as which country will have the new reserve currency, I cannot see any new clear future candidate as per today. Here is a weekly chart of the British Pound for short called XBP. The XBP has been declining for about a decade. The Elliott Wave structure is a large A, B and C correction since 2007 marked in blue colour on the chart above. Wave ‘A’ down ended in early 2009. A large side wave correction that we have labeled as wave ‘B’ ended in the middle of 2014. Since then, the XBP has been declining in wave ‘C’. The XBP is declining in wave ‘C’ down. The decline will take the British Pound near parity with the USD in a few years. GCV: Can you illustrate by using a chart how fast-moving Bitcoin can be and how you assisted your investors, what actions were taken for example? The last few years we have been holding Bitcoin cash. Since the stock market, as well as the grey market, are at historically overvalued levels, we are not investing. However, we are ready to do so when the next bear market occurs most likely in 2017. GCV: What is available from an education standpoint at Cryptor Trust to assist inexperienced and experienced Bitcoin investors? We offer a free Education Center on investment at our website elliottwavetechnician.com. We also offer different paid subscription services. The basic one is our monthly newsletter that covers all major global markets that include stock markets, commodities, currencies (including Bitcoin), demographics, and social trends. GCV: If the stock market crashes in the near future how will this affect Bitcoin and other cryptocurrency exchanges? How safe are they from being influenced by such a disaster? Most likely it will drive more people to hold and use cryptocurrencies. Centralized Cryptocurrency Exchanges are also at risk if they have centralized control of their clients’ money. When authorities introduce currency control/regulations as defence, the centralized exchanges then will be forced to impose this on their clients. Regarding how regulations will affect investing in Bitcoin when the attraction is that it has very little regulation, decentralized cryptocurrency exchanges and private wallets will not be affected, only centralized exchanges, as the authorities and 3rd parties, have no control/access to them. GCV: What are the implications if cash and fiat currencies are no longer used? What would happen to the price of Bitcoin and cryptocurrencies in general? Since a large part of the population around the world have no or limited access to technology that will take time. More restrictions and regulations will be a catalysator for increasing use of cryptocurrencies. Expect it to put an upward pressure on the price of Bitcoin and cryptocurrencies. GCV: As the founder of the Elliott Wave Technician, can you make any predictions regarding how Bitcoin and blockchain technologies will fare in a Fourth Industrial Revolution world? GS: Yes, I think the rise of Bitcoin to around 1.200 was the initial Wave (1) rise in Elliott Wave terms. 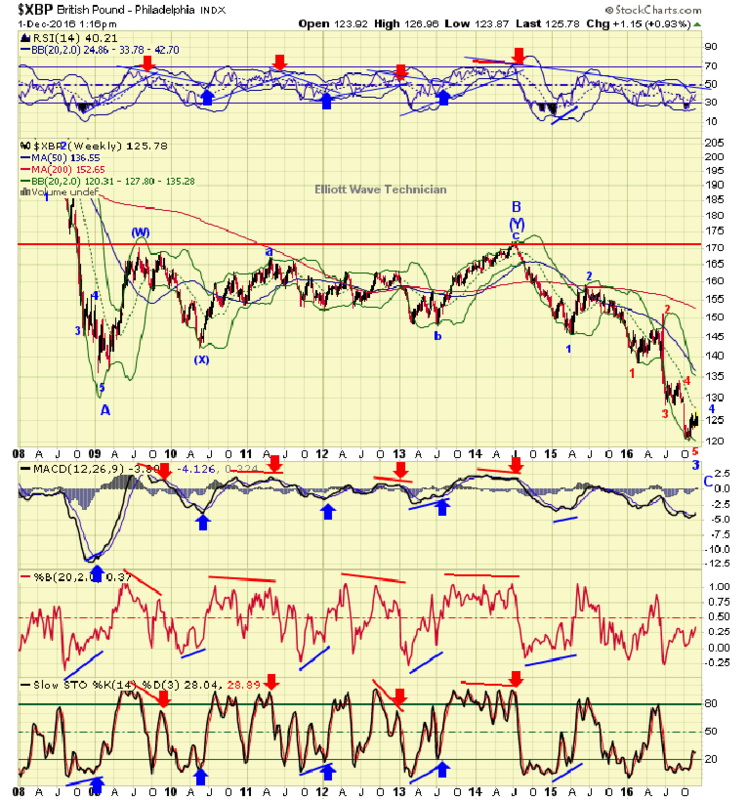 What we have experienced since that peak is a wave ‘(2)’ correction. The decline to less than USD 200 could be all of the correction. However, I think it is more likely that it was only wave ‘A’ of a larger wave ‘2’ and the current rally is wave ‘B’ up. If this is the case, we will have another decline in wave ‘C’ to complete wave (2). A target of this decline would be to less than USD 200. After that, the real rise begins in wave ‘(3)’ which is the most powerful wave in Elliott Wave theory. If Bitcoin takes over one-third of the world’s remittance market, the price would conservatively go to more than USD 20,000. 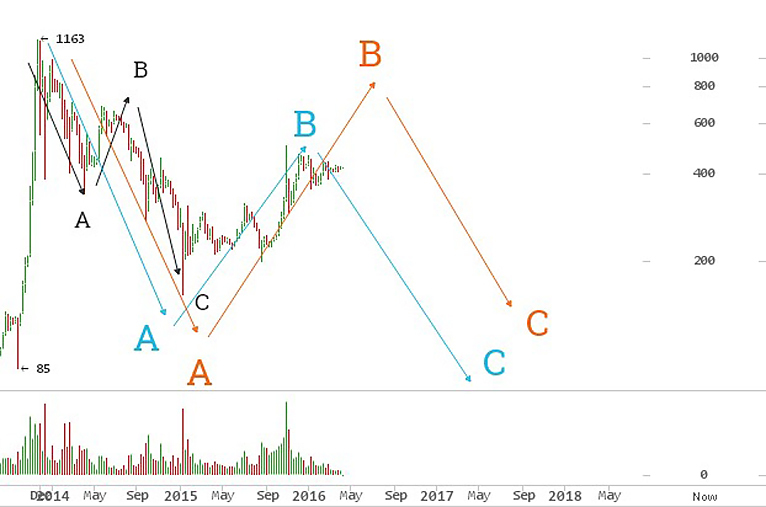 See my earlier long term forecast of the Bitcoin price potential in The Street. The alternative, of course, is a much more near-term bullish outcome, which is that we already have fully completed a larger wave ‘(2)’ correction, and are in wave ‘(3)’ up, if so we will then still have a correction in wave ‘2’ of ‘(3)’ before the rise continues in wave ‘3’ of ‘(3)’. If this is the case, the size of the correction could be typically 50% or 62% retracement of the current wave up over the last few years. Bitcoin moves very fast so if you try to be smart and trade the waves you could easily lose a large part of the rise. The Elliott Wave principle describes the psychology of crowds. Social mood (mass psychology) drives social action and has structure and form. It reveals that mass psychology swings from pessimism to optimism and back in a natural sequence, creating specific and measurable patterns. One of the easiest places to see the Elliott Wave Principle at work is in the financial markets, where changing investor psychology is recorded in the form of price movements. If you can identify repeating patterns in prices, and figure out where we are in those repeating patterns today, you can predict where we are going. The Elliott Wave Principle is named after its discoverer Ralph Nelson Elliott (1871-1948) which was developed during the 1930’s. Elliott Wave Principle measures investor psychology, which is the real driver behind the stock markets. When people are optimistic about the future of a given issue, they bid the price up. Using the Elliott Wave Principle is an exercise in probability. An Elliottician is someone who is able to identify the market’s structure and anticipate the most likely next move based on our position within those structures. By knowing the wave patterns, you’ll know what the markets are likely to do next and sometimes most importantly what they will not do next. GCV: Besides using the Elliott Wave Technician, what other methods do you use when researching and deciphering the quick moving path of Bitcoin to assist in the investment process? The price of Bitcoin is clearly displaying an Elliott Wave structure, and that means the price is driven by mass psychology, so technical analysis of the price structure and Elliott Wave theory are the best tools to forecast price movements. In addition, we look at emerging technologies and potentially new competing cryptocurrencies. GCV: What exchanges do you use in Europe and North America and why? We do not focus on certain exchanges as such, it is more like you buy the shares of a company you are investing in on the exchange they are traded. Also, remember that most Bitcoin and blockchain related companies are more like startups or only are a few years old, meaning that you do not find them on formal exchanges, but more likely in the informal grey or private market. GCV: How can you appease the fears of customers after hearing about the hack in August 2016 of the exchange platform Bitfinex where approximately $70 million worth of Bitcoins were stolen from the exchange? Well, the same happens to banks. The last case I remember was the hacking of the central bank of Bangladesh. I think the heist amounted to about 101 million USD. This happens to banks regularly. With cryptocurrencies, you can avoid these problems, by storing your cryptocurrencies in your own private physical wallet offline and only use exchanges that are fully decentralized, where the client only is controlling the money. My forecast is that hacking of banks and centralized exchanges will only increase in the future. However, I think that the biggest threat to banks and centralized exchanges are the authorities, going after them, in connections with new currency restrictions, tax regulations, and heavy fines. Remember that many exchanges are in a position to block/freeze clients’ cryptocurrency accounts. In order to avoid risking this, I recommend that you use decentralized exchanges when possible. Here are some links on the Cryptor Trust website. GCV: Do you suggest your clients get insurance when investing in Bitcoin just to be on the safe side? No, I do not see the value with having insurance. The insurance companies are just another risky entity. There are many other ways of securing your funds like diversifying by using different wallets, hardware wallets, etc. GCV: Cryptor Trust is expanding into distributed, blockchain based finance. Can you share what benefit this will bring to investors and how Cryptor Trust will be a positive, progressive influence in the Fourth Industrial Revolution? I described in some of my previous answers how important it is to keep control of your own money and avoid that banks, exchanges, authorities, and others are in control. Prepare for more currency controls, devaluations, regulations, and heavy penalties that are underway in the Western World. Europe is the window of how this will play out near term. We already know what happened in Cyprus and Greece. Let us see how it plays out in Italy now. I expect that the banking crises in Italy will break the European Union into confetti. The deposit holders should prepare for heavy losses. They are lucky if they get anything back. I absolutely love your blog.. Great colors & theme. Did you create this amazing site yourself? Please reply back as I’m trying to create my own site and want to know where you got this from or just what the theme is called. Appreciate it! Thank you! I customized a WordPress theme yes. I did the color scheme myself since I’m a Graphic Designer as well as a Writer/Blogger. Go to StudioPress. They have a lot of themes there you can customize although, you still have to know a lot. If you have any questions, send me an email via my contact page.